All you have to do is lower uric acid to safe levels. And, take gout pain relief until most of your old uric acid crystals have dissolved. Do you lower uric acid with pharmaceutical? Or, herbal gout medication? What is your safe level for uric acid? How does your safe uric acid level change as time passes? Which is the best uric acid lowering treatment to suit your medical history and personal preferences? Which is the most effective gout pain treatment combination? Do you take gout pain treatment as required? Or, as a preventative? Which gout treatments are compatible with treatments for other illnesses? How much does your doctor/herbalist/other health adviser know about the latest gout treatment recommendations? You must refine treatments, as you start to control gout. You must make similar choices whether you are being treated with gout medications. Or, if you are seeking natural gout remedies. You must set targets for pain control. And, for uric acid control. As the uric acid control begins to work, you can reduce gout pain relief. Until, eventually, you become free from pain. Treatment of a gout attack is rarely simple. Why? Because there are 3 points to consider. And, one of these can be very confusing. Uric acid level monitoring with dose adjustment. Do not simply rely on your doctor’s advice. Or, the instructions for a natural gout remedy. Because you have to take control by learning how to assess your current situation. And, how to set targets for managing your plan towards becoming gout free. I cover details of how to do this in the Understanding Gout Section. This Gout Treatment Section is to describe all the different gout medications and other remedies for gout so that you can choose a package of treatments that suit you. I am working on my personal gout treatment planning service – Stop Gout. I will help you create your own personal treatment plan. Be sure to subscribe to my gout update service so you do not miss the launch. You can follow my progress pre-launch in my Gout Treatment Plan pages. 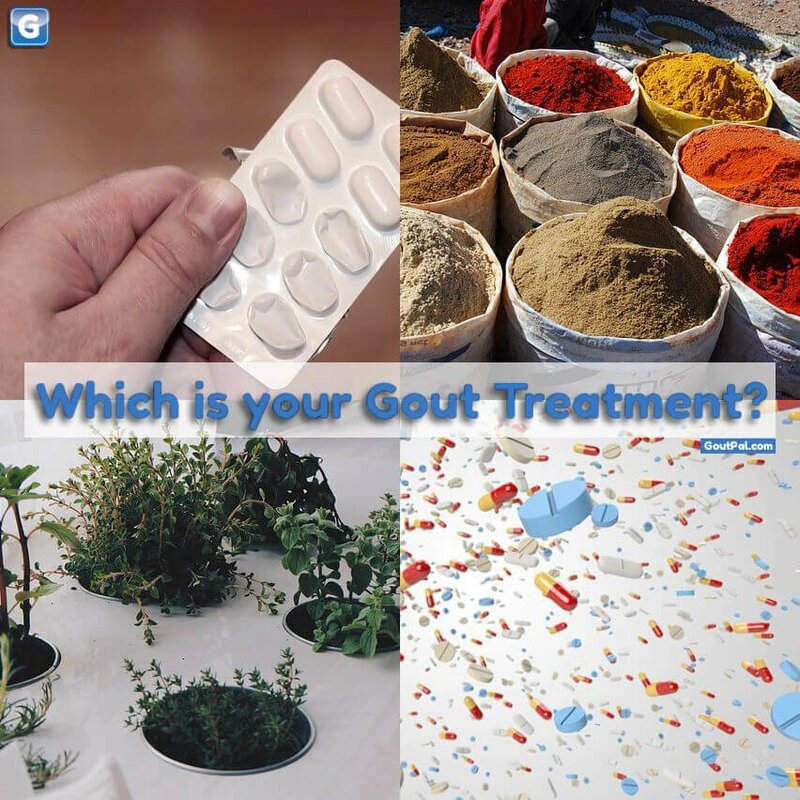 Which type of gout treatment for you? Your gout management plan can include selected drug therapies, natural gout cures, and lifestyle changes, or a combination. I deal with lifestyle changes in the Gout Diet section. When considering non-medical remedies, there is some overlap between diet and certain foods that have been attributed with healing properties. In these cases I will cover nutritional properties in the Gout Diet section, and healing properties here. In most cases, gout medications have a specific role. And, I have classified them accordingly. So, you can select a treatment to lower uric acid. Then, perhaps, add pain relief treatment. Because you still gout flare risks during the early stages of urate-lowering therapy. Natural and other alternative treatments are less specific. So, this makes them more difficult to manage. Because results are less predictable. Also, results vary widely among people. Nevertheless, you must still manage uric acid first. However, many natural treatments, have not been assessed for uric acid lowering properties. Despite, strong anecdotal evidence that they help gout sufferers. In this regard, you must look to your own test results. I explain gout medications and natural products or techniques that can be used to treat gout. I have divided them according to how they affect the Gout Pain Pathway. Uric Acid Lowering Gout Medications To Avoid Gout Drugs that inhibit uric acid production, or encourage it’s excretion. Urate Deposit Removal Treatment For Gout Lowering uric acid will cause most urate deposits do dissolve. Beyond that, tophi can be removed by surgery or draining. Kidney stones can be surgically removed, and have also been treated by sonic vibration. Immune Response Treatment Anti-Inflammatory Gout Cure In addition to colchicine and a wide range of COX inhibitors, some treatments previously aimed at rheumatoid arthritis are effective at blocking different aspects of the immune response. Gout Pain Blocking Gout Pain Relief Various analgesics block pain signals reaching the brain. Related to medical gout treatments, is a phenomenon called treatment failure gout. Which, we sometimes refer to as intransigent or refractory gout. It applies to gout patients who do not respond to uric acid lowering treatments. Or, who cannot tolerate them because of allergy or other health problems. Treatment failure gout has spurred the pharmaceutical industry into developing alternatives to allopurinol. So, Uloric (febuxostat) is now widely available. And, Rasburicase has some limited applications. Also, Krystexxa (pegloticase) is gaining ground in severe treatment failure gout. In future, I will continue to report on new gout treatments as they develop. And, I’ll add them to your list of gout treatment choices. In the meantime, I have some background and figures about treatment failure gout. Uric Acid Lowering Gout Cures Natural uricosurics and xanthine oxidase inhibitors. This includes treatments that have been shown to lower uric acid where the mechanism is uncertain. Diet Relief Natural Gout Remedy Foodstuffs and beverages that relieve gout pain. Herbal Remedies Gout Home Remedies Dietary supplements, additives, and other preparations that relieve gout pain. Other Non-Drug Treatments Gout Relief Physical, electronic, and other medication-free pain relievers. Upcoming Treatments Gout Home Remedy Research Natural substances that are currently being investigated for gout treatment potential. In addition to the specific new treatments listed above, there is always lots of research into the general treatment of gout. Sometimes this leads to new treatments, sometimes it leads to new gout management techniques, and sometimes the research is just research. Even where no definite new gout treatments are found, general research gives us a better understanding of how gout reacts to different situations. If you want to know possible new directions for the treatment of gout, this research will keep you informed. Now you see that there is a wide range of gout treatments available, you need to plan what to do next. If you are new to gout, you and your doctor will focus mainly on pain relief. Make sure you are aware of your options. Then, work with your doctor to see which is best for you. Sometimes combination therapies are most effective. If you have had more than one gout attack, you must arrange with your doctor to start uric acid lowering treatment. Leave Gout Treatment to browse the Gout Guidelines Introduction. Dec 01, 2009 (first archive). First Published. MMM nn, YYYY (archive). Meta desc changed from “Gout treatment is easy! All you have to do is lower uric acid to safe levels, and take gout pain relief until most of your old uric acid crystals have disso” to “Gout treatment is easy! But only when you choose the right combination. See all gout treatments available. Then get the right gout treatment for you.” [ref 51/22109/9.3]. Removed 2016 personal gout treatment paragraph. Replaced featured image. Removed links title attribute. Some grammatical improvements. If you see gout pages that I should improve, please suggest a GoutPal page review.